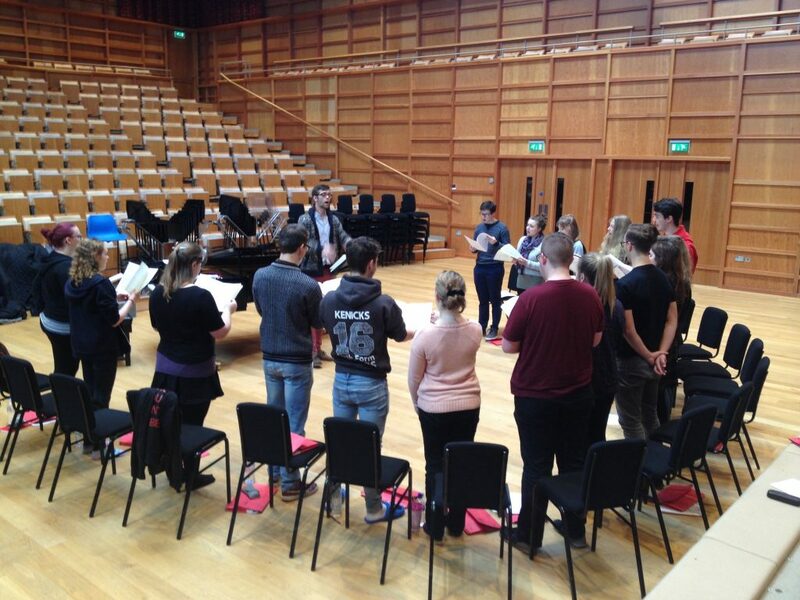 The Chamber Choir had its termly workshop day on Saturday, a concentrated rehearsal period that offers scope to work for longer than our customary weekly two-hour period, and really drill down into the nitty-gritty aspects of the music we’re singing this year. This year’s assistant conductor, second-year Doug, roused the Choir into an early Saturday state of wakefulness with a series of technical warm-up exercises, before moving in to rehearse the group in Tavener’s The Lamb. The piece sounds deceptively straightforward, hiding the angularity of the lines that weave around one another in ever-changing intervals and palindromes. 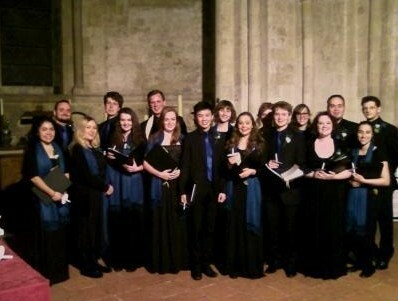 We then worked on two Italian madrigals, one of which is Lassus’ The Echo Song which creates the illusion of a choir playing with (and mocking) its own echo, throwing material antiphonally between two choirs and which we’re hoping to exploit spatially to the full in the concert in the Cathedral Crypt in the spring. 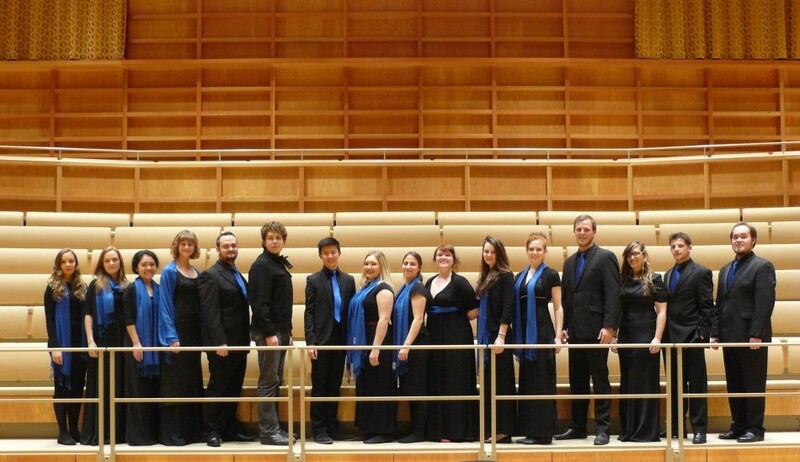 Perhaps the most rhythmically challenging piece we are performing this year is Augustinas’ Tykus, Tykus, which again pitches two choirs aganist each other in rapturous and cascading sections, driven by a fierce, almost tribal energy. We initially rehearsed in individual choirs (the other choir going for a well-earned tea-break), followed by putting both choirs together. You really have to know exactly where your line enters during this piece, with short phrases often scattered throughout the texture coming in on the half-beat; and the fact that we’re also singing in Lithuanian creates additional, linguistic hurdles for the choir to face. In contrast, Doug took the choir through Purcell’s solemn Thou Knowest Lord, which has spaces in the music of heightened dramatic tension, as the Choir beseeches God ‘shut not Thy merciful ear unto our prayer.’ The morning ended with Warlock’s Lullaby, My Jesus, arranged by Andrew Carter, full of yearning chromaticism in the inner voices that need to be delivered confidently if we are to deliver the quite astonishing dissonances which Warlock unfurls throughout this highly expressive carol. Lunch was dominated by the eager anticipation of this year’s home-made quiche made by Matt; last year, Inger had set the bar high and there was some pressure, but I’m pleased to say that Matt’s was every bit as good – at least, if the fact that it apparently disappeared extraordinarily fast is anything to go by. Amongst the repertoire we rehearsed in the afternoon, the hynotic, dancing lullaby (a recurring theme amongst repertoire this year) And by Alec Roth; another two-choir piece, it combines circling ostinati with bell-like cluster-chords in a lulling opening, supported behind by sighs and sussurations in the second choir in a soundscape mimicking the sleeper’s breathing. Doug’s third piece, Hassler’s Cantate Domino, combines lyricism with a sprightly triple-meter middle section, which the choir is starting really to enjoy. 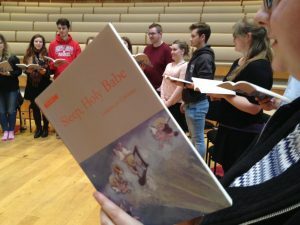 We ended by playing with space in a literal sense, arranging the choir around the balcony of the concert-hall to sing Alexander Campkin’s carol, Sleep, Holy Babe. This is all about removing the safety of singing in close proximity, encouraging each singer to sing confidently, committing to their line and developing a rich ensemble sound. This took some getting used to, but when the Choir came back together to sing in formation, the effect was immediate; the singers felt more confident standing together, but still sang with the commitment to the voice-parts, and the result was a fuller sound. The Choir will be singing the piece next month in Canterbury Cathedral, so it’s important that they grow accustomed to filling quite a large space…! It’s customary, on workshop days, to do the latter part of the day in concert-mode, i.e. 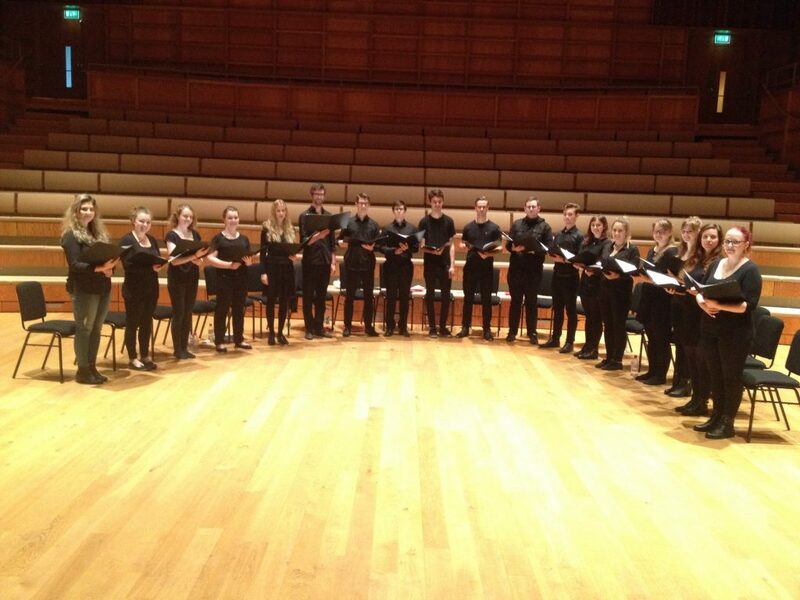 with the dress-code and performance folders that we will be using on the night; it’s a particularly effective means of focusing the Choir’s attention on the fact that they will soon be performing in public, and to start getting used to standing, holding ourselves as a group. (It also allows everyone to check they have the right clothing in the right colour…). 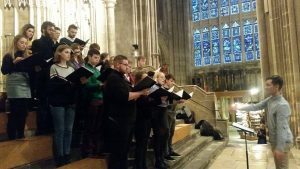 It definitely creates a mock performance condition, as we head towards our first engagement, singing in the Nave of Canterbury Cathedral to over a thousand in the congregation in the University Carol Service next month. The afternoon ended with the Choir learning a carol, Sleep My Jesu, written by Jamie W Hall as part of a seasonal initiative to raise money for Macmillan Cancer Care under the #choirsagainstcancer hashtag. The choir took the piece up very quickly, and half an hour later we recorded a performance as a means of participating in the nationwide project to raise money for this very worthy cause. Considering that this was only the fourth time we’d sung through the piece, and the second without the piano, the group picked this up very quickly indeed! (Find out more about the initiative or make a donation here). This entry was posted in In rehearsal, Sound thinking and tagged Carol Service, Chamber Choir, workshop on November 7, 2016 by Daniel Harding. 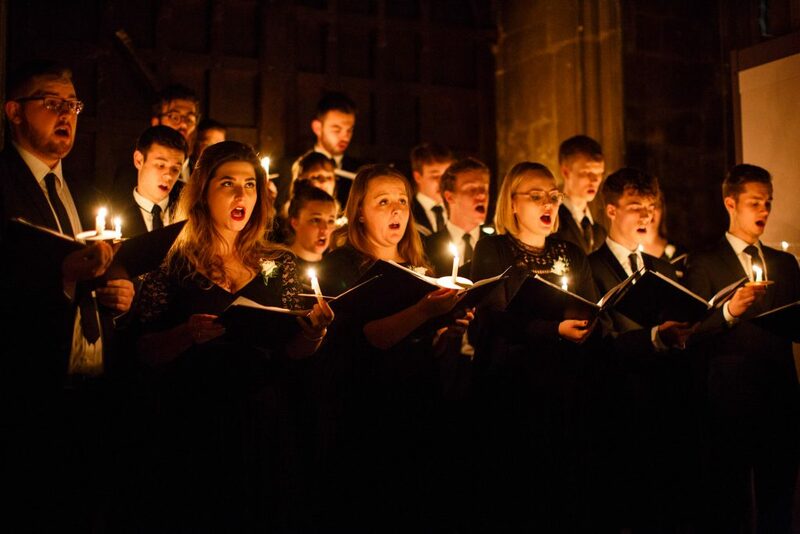 When you are preoccupied with such issues as getting in place by the end of Once in Royal David’s City, processing without tripping up, juggling a folder of music and a lit candle without setting light to anything, and not letting your candle burn down to your fingers, then you know it can only be the annual University Carol Service. 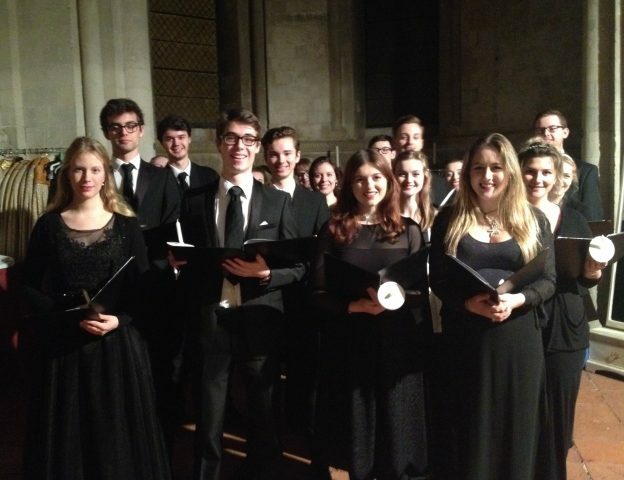 Last night’s service, always a high-point of Kent’s cultural calendar, saw over a thousand people packing out Canterbury Cathedral, including the members of Minerva Voices, who performed several solo pieces as well as leading some ringing descants in the congregational hymns (which involved some serious planning over dinner betwtixt rehearsal and concert). The choir arrived in the Nave yesterday afternoon, to rehearse its repertoire, as well as to practice processing from the West Door down to the steps before the rood screen, and to get accustomed to singing in such a magnificent venue. Standing at the end of the Nave, you suddenly realise the volume of vaulted space that the Choir needs to fill with sound. 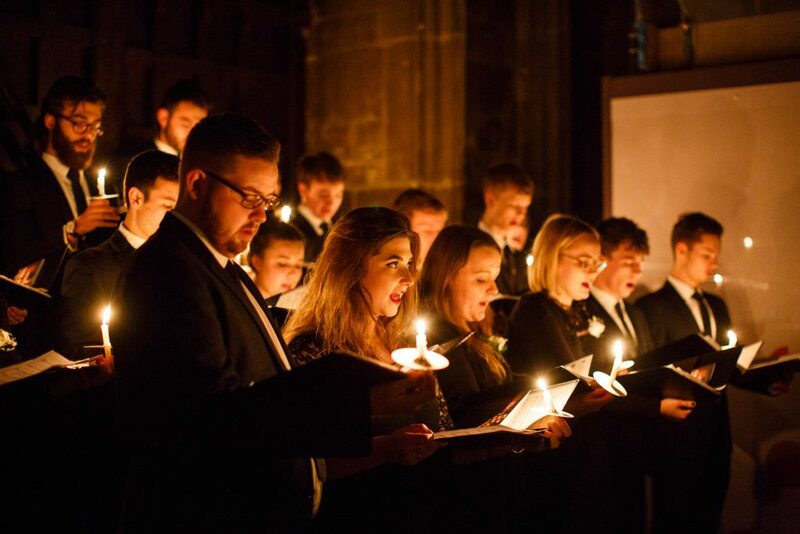 At 7.55pm, the Choir walked down the side aisle to take up position in front of the West Door; the Dean bid everyone welcome, the lights were extinguished, the first reading delivered, and then a sprightly rendition of Past Three A Clock blossomed into life to fill the expectant hush. 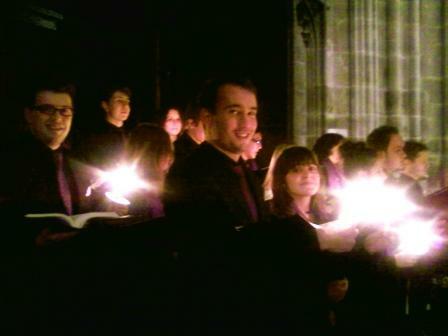 Assistant conductor, third-year Joe Prescott, led a vivacious performance that set a joyous tone for the service. The congregation then stood, and that magical moment that really unwraps Christmas occurred; the solo opening verse of Once in Royal David’s City, in a ringing performance from second-year Music Scholar, Charlotte Webb, that soared to the Cathedral’s vaulted roof and rang clear around the Nave. The ensemble rose to match it in the second verse, before the third verse drew Choir, congregation and audience together, and we were off. 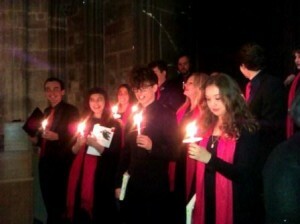 The mix of carols and readings also saw the Choir performing the Coventry Carol in a rendition that explored the piece’s melancholy and woe in significant detail; the final solo carol was a vigorous reading of the medieval Nowell Sing We Both All And Some, delivered with gusto in rousingly celebratory fashion. 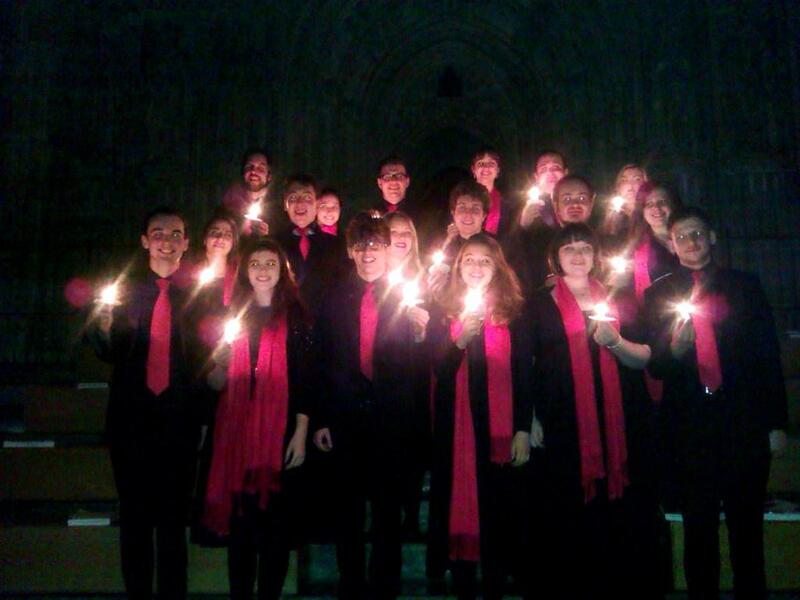 The service closes with a candlelit communal performance of Hark the Herald Angels Sing, and as the congregation departed, bearing their lit candles out into the night and into the mist-strewn city streets, you felt the reach of Christmas go with them. 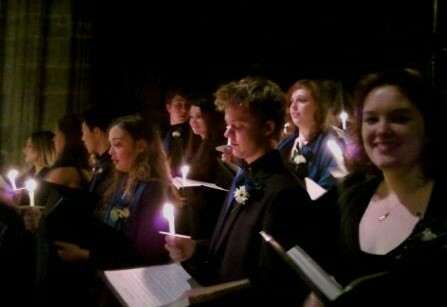 It’s a wonderful occasion, with so many of the University community coming together to hear anew the message of the season in words and music, to reflect on the tidings of the moment and to reach out to others. Now that really is the meaning of Christmas. 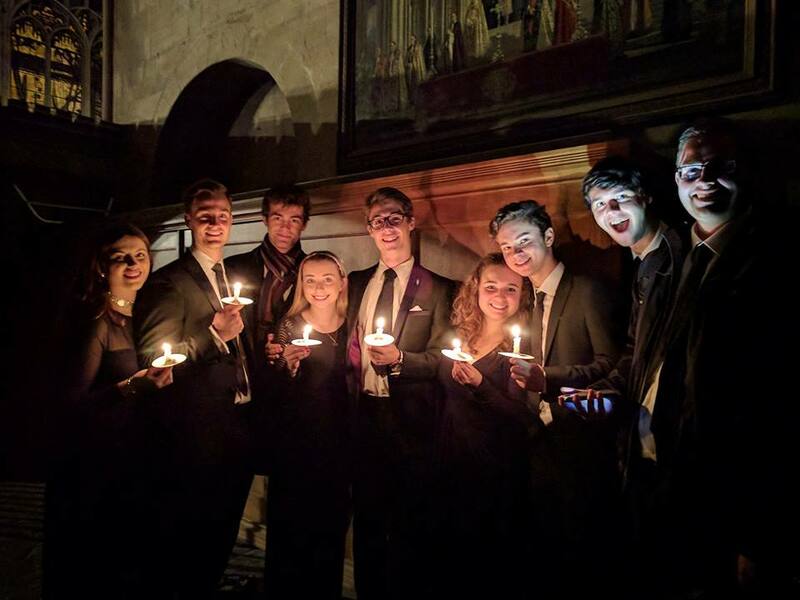 Minerva Voices is back in action next term when rehearsals begin anew on Vivaldi’s Gloria and an eclectic mix of repertoire for the Crypt concert in February. Meanwhile, season’s greetings to everyone! 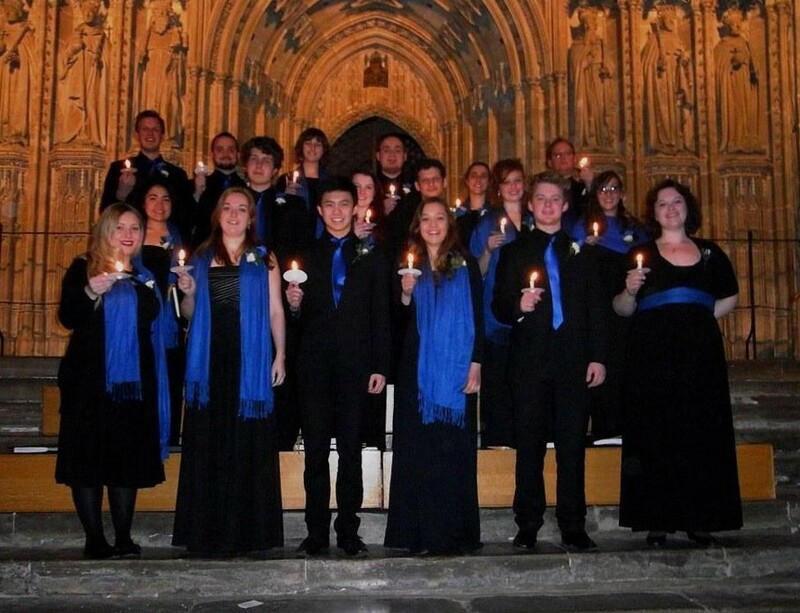 This entry was posted in Concerted effort and tagged Canterbury Cathedral, Carol Service, Christmas, Minerva Voices on December 15, 2015 by Daniel Harding. 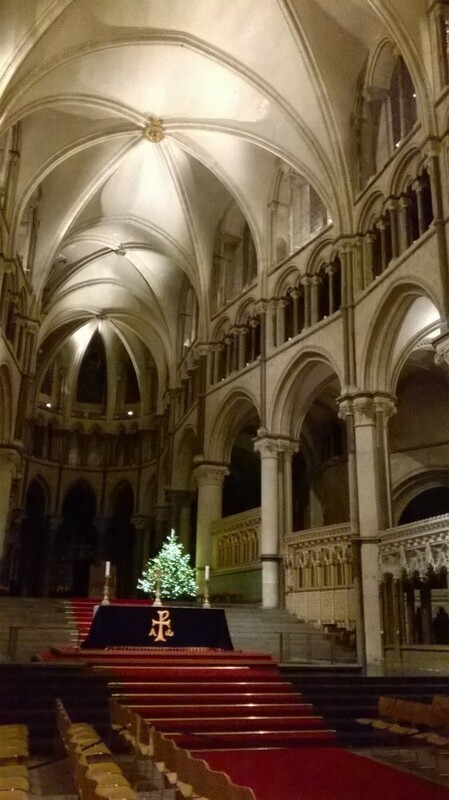 As I drove a few of the Chamber Choir back to campus last night, after the Chamber Choir had sung in the annual University Carol Service in Canterbury Cathedral, we were all reflecting on how fortunate we are to be involved with such an astonishing space. The University holds its annual degree ceremonies for its Canterbury students there, and as well as the carol service, we also hold the yearly Colyer-Fergusson concert each spring in the vast Cathedral Nave; the Chamber Choir also performs each spring in the Cathedral Crypt. Last night’s Carol Service was the traditional celebration of the season, with carols, readings and reflections on the message of togetherness and reconciliation. 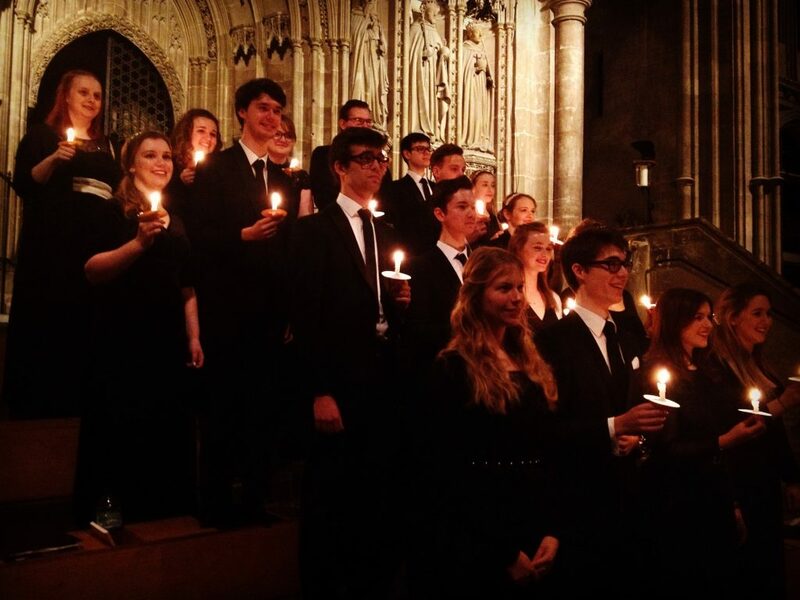 As the Cathedral lights slowly went out at the start of the service, we were gathered at the West Doors clutching our lit candles; a moment, and then Matt began the service with Ord’s Adam Lay Y-Bounden, launched briskly into the vaulted heights. The congregation then stood, and soprano Emma’s clear soprano rang out over the assembly with the opening solo verse of Once in Royal, and we were underway. As the service unfolded in words and music, there was the customary minefield that is singing Silent Night in a multitude of languages, a celebration of the University’s international community; Marek, one of the tenors, is Polish and was able to deliver the Polish verse with aplomb; alto Charley had diligently been working on the Japanese verse with one of her flat-mates; the rest of us grappled heroically with trying to fit the syllables of other languages to the well-known tune with mixed results. 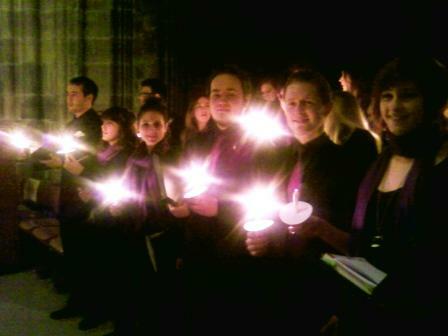 We stood to sing the evocative Gabriel’s Message and, later, a rousing account of Deck The Hall. At the end, all the congregation candles were re-lit for the final prayers, proclamations and hymn – the Nave became a sea of small flames dancing intimately to O Come, All Ye Faithful, before they were carried out of the Cathedral into the Close and beyond, out into the city. 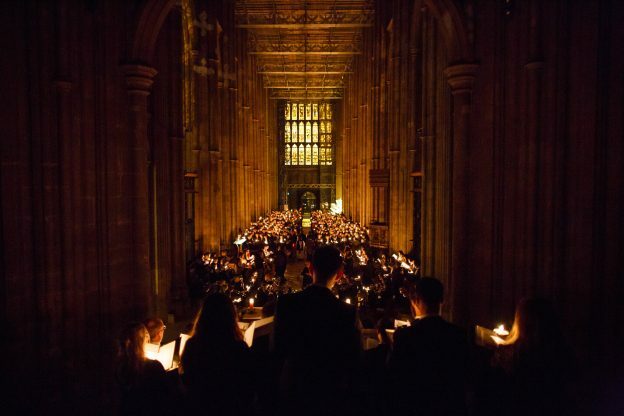 A wonderful occasion to which everyone looks forward from the moment we meet for our first rehearsal each October; an opportunity to sing in one of the world’s greatest cathedrals, and to celebrate the season with music, with friends and with the University community. 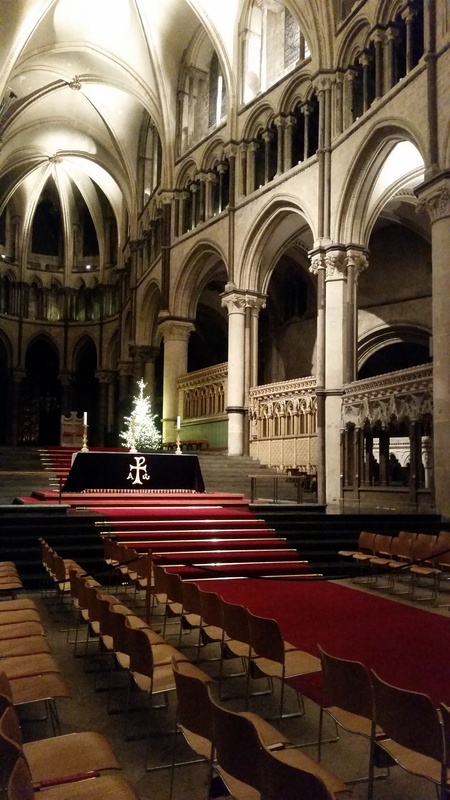 This entry was posted in Concerted effort and tagged Canterbury, Carol Service, Cathedral, Chamber Choir, Christmas on December 10, 2013 by Daniel Harding. 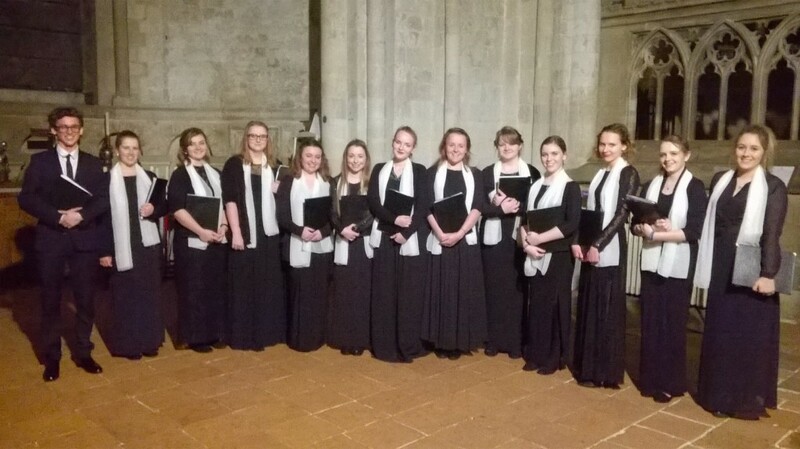 It’s been the end of a very busy period for the Chamber Choir, with two performances as part of the Gala weekend of concerts celebrating the opening of the new music building, followed hard upon by rehearsing and performing in the Cathedral for the University Carol Service. All of the hard work and commitment came to fruition on Saturday and Sunday with two terrific performances in the Gala concerts, and the most interesting thing to have emerged from both occasions is the fact that all the comments and feedback that have come my way since, all of them have referred to the fact that the pieces were performed from memory. Everyone has noticed this, and it has obviously made a significant impact. 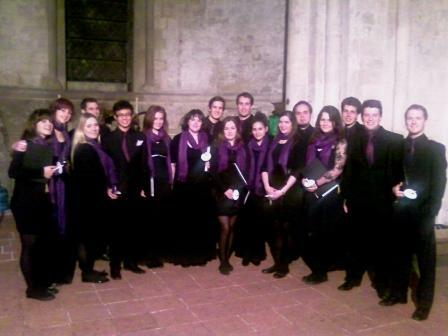 I’m very pleased at this; it’s something that the Choir itself (well, Paris at first, but then everyone!) decided it wanted to achieve, and they have worked extremely hard to get the music off the scores and into their heads. It’s certainly true that, as soon as you’re not looking down at the music but out at the audience, you deliver a piece with greater conviction and heightened levels of communication. And it’s clearly worked. 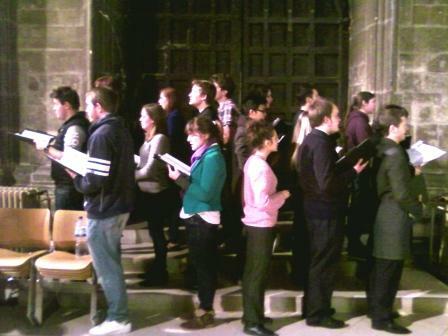 There was a sense of euphoria, therefore, as we gathered in the Cathedral on Monday afternoon, to start rehearsing for the Carol Service. The first two carols are sung from the West end, behind the congregation; and as we did last year, we sang facing sideways to each of the adjacent pillars (no-one can see us: the lights are switched off, and everyone is facing the other way!) to get a little more resonance, and some return on our sound. As usual, the most excited confusion came with organising how we would process from this formation down the Nave during ‘Once in Royal’ and end up in the right formation on the choral risers behind the altar. Not overlooking the fact that some of the ladies had long dresses and long hair, troublesome for navigating steps and handling lit candles respectively. Having retired to an adjacent hostelry for dinner in between rehearsal and performance, we gathered in the north aisle at 7.15pm, where Emma led the Choir in her usual dynamic warm-up exercises beneath the sheltering sounds of the Salvation Army playing pre-service carols to the slowly assembling congregation. 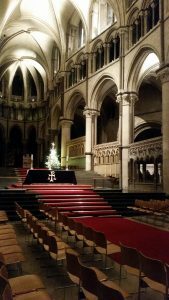 Shortly before 8pm, we processed down to the West doors, and waited whilst the lights in the entire Cathedral were doused and candles were lit; from out of the darkness Emma launched ‘The Sussex Carol’ with sprightly vigour, to which the Choir responded, and the service had begun. After a short silence, there then rose the wonderful warm tones of Paris, one of the sopranos, in the opening verse of ‘Once in Royal,’ with a lovely relaxed, flexible and confident sound. No matter how many years one has heard this carol at the start of a service, there is nothing quite like hearing it at the start of the Carol Service in Canterbury Cathedral. The processing went, you will be pleased to hear, without a hitch – none of ladies tripped up as they ascended the stairs, and no-one set light to anyone else – and the rest of the service unfolded in the majestic surroundings of the city’s historic cathedral. At the end of the service, the order of service bids us take our ‘lit candle out of the Cathedral and into the world.’ As I left the Cathedral, walking across the city centre, in front of me a Chinese family were similarly heading home, and the two small children were doing just that – carrying their candle, still alight, through the city. They turned off ahead of me and disappeared down one of the smaller snickleways, and I watched the candlelight dwindle as it must have done many hundreds of years ago, passing between Tudor-timbered shop-fronts as it faded into the night. 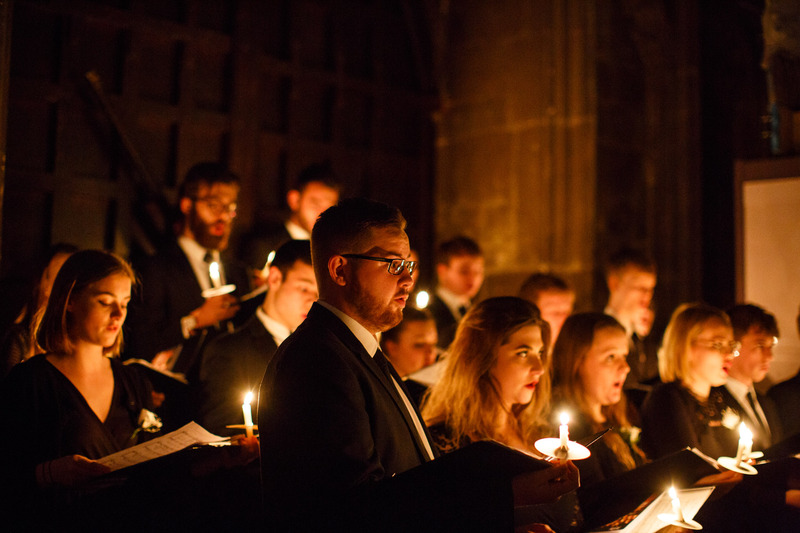 This is the real magic of the University Carol Service – the combination of a vibrant, international community coming together in an historic venue, where the current University members renew again the Christmas message in the middle of an ancient city. 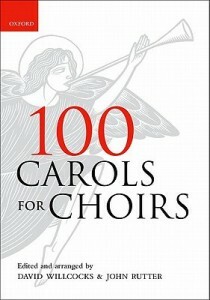 This entry was posted in All of a piece, Concerted effort, In rehearsal and tagged Carol Service, carols, Cathedral, Gala concert on December 12, 2012 by Daniel Harding. In the choral calendar, you always know that Christmas is looming when you crack open that perennial workhorse of the songster’s year, Carols for Choirs. 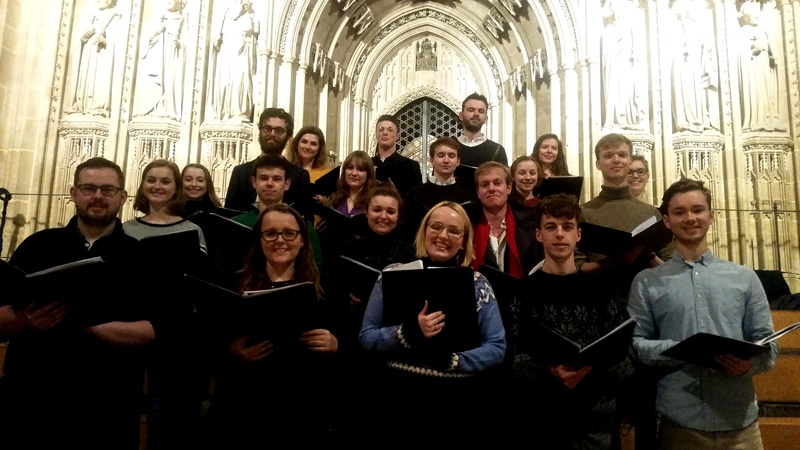 For the Chamber Choir, Christmas began earlier this week, when we wheeled out the copies in order to start rehearsing for the University Carol Service in December. As usual, we’ll be preparing three carols to sing during the service, plus harmonised verses to ‘Once in Royal David’s City’ and others. There’s usually the challenge (for Kent is the UK’s European University, is it not) of singing one of the carols in a variety of excitingly bewildering languages as well. And, of course, we’re still in full flight towards the Gala concerts to open the new music building in the two days before the service. We’re starting to leave the piano behind more and more in rehearsal, although this has occasionally resulted in our leaving our intonation behind as well… then again, that’s what rehearsals are all about! Meanwhile, the Cecilian Choir is branching out from the Britten ‘Ceremony of Carols’ by looking at pieces by Mendelssohn and Debussy – well, we have native German and French speakers in the choir, so it makes sense to use their advice on pronunciation! 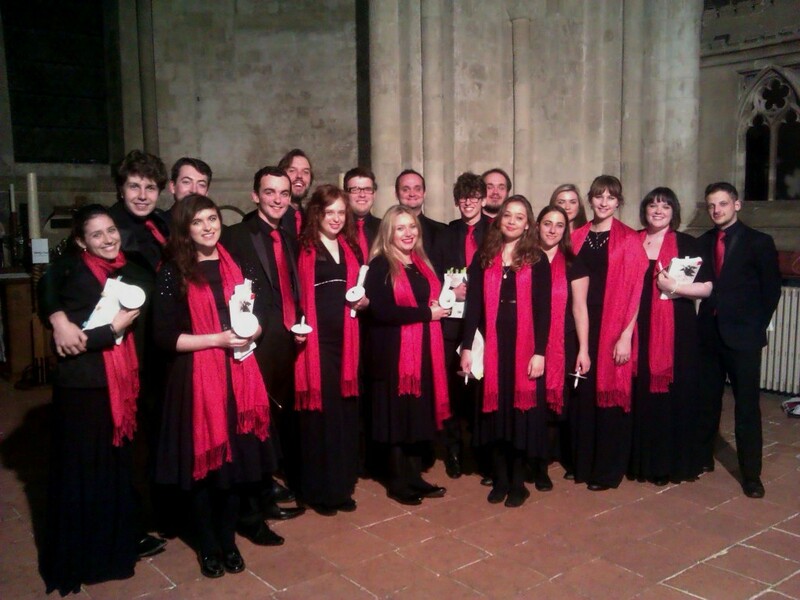 This entry was posted in In rehearsal and tagged Canterbury Cathedral, Carol Service, Carols for Choirs, Grand Gala on November 9, 2012 by Daniel Harding. 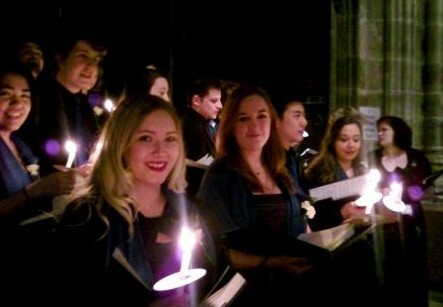 The annual University Carol Service in Canterbury Cathedral is one of the high points of the cultural year, a moment when the University community comes together to celebrate not just the Christmas message, but also its own diversity; with readers, musicians and participants from across the range of denominations and countries, a rich, international pot pourri that gives Kent, the European university, a unique identity in the UK. 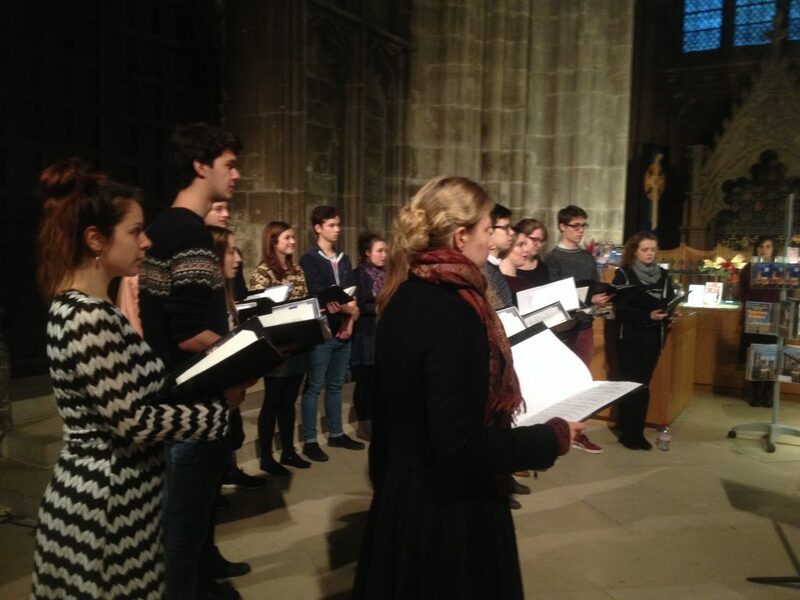 The Chamber Choir, itself a microcosm of the range of countries, cultures and beliefs that find a footing at the University, spent the afternoon rehearsing in the Cathedral before the service, exploring some novel ways of standing (this has become something of an idée fixe with the group this year: when a choir is this good, the possibilities for sonic experimentation begin to widen in an exciting fashion). The greatest challenge to the group wasn’t actually singing; rather, it was in organising its processing, in order to be able to move down the Nave to Once in Royal and end up in the correct formation on the steps in front of the rood screen at the other end. This led to some serious rehearsing of things such as standing and walking. But, once we’d worked out who moved when and in which order, and practiced walking with stately tread down the Nave (but still quick enough to get to into place before the carol finished – now that would have been embarrassing…), we rehearsed Remember, O Thou Man and our sections of the congregational carols standing on the steps. After a decidedly indulgent dinner at an adjacent hostelry, we returned to the Cathedral, and had a half-hour warm-up in a tiny ante-chapel near to the East end, well away from the congregation arriving early and with our rehearsing covered up by the robust playing of the Salvation Army’s pre-service carols. This turned out to be a lively and entertaining session, in which Steph led the group through some of the customary warm-ups and tongue-twisters (which were as nothing, it turned out, compared to the linguistic minefield of singing Silent Night in a variety of unfamiliar languages; as a way of celebrating its international identity, the carol service includes each year this piece with verses in several different languages). We then explored different dynamics, singing in a circle facing outwards, singing crouched or standing, and generally, well, having a great time (yet productive too!). 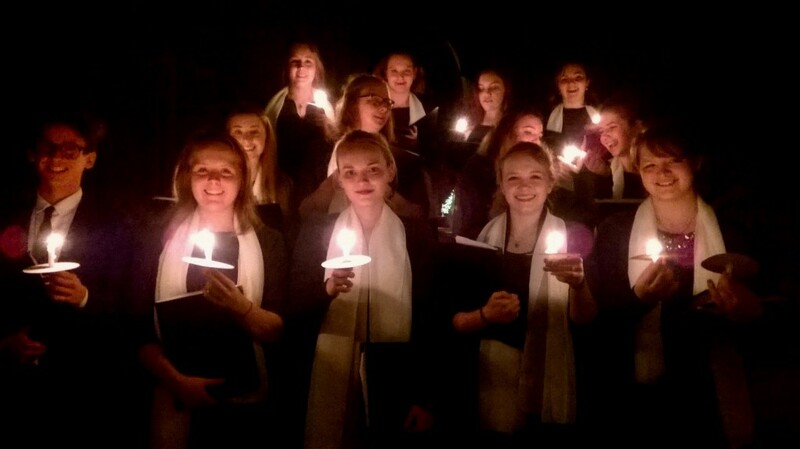 We then lined up – in our by-now well-rehearsed processional ranks – and filed down to the West end; our candles were lit, the congregation were welcomed, the lights of the Cathedral were extinguished, and then Steph led the group in Carol of the Bells. As the echoes died away deep in the East of the building, the congregation stood, and second-year soprano Marina lifted her voice to the great roof in the soaring opening of Once in Royal David’s City, before the Choir clothed the second verse in the rich harmonies of the tutti section. Listening back to some of the rehearsal recording I’ve taken over the course of this term, it struck me that there is a great deal of singing, a lot of hard work, and an equal measure of laughter and mirth. I take this as a good sign; the group are, after all, there to have fun as much as they are to work and develop as an ensemble. 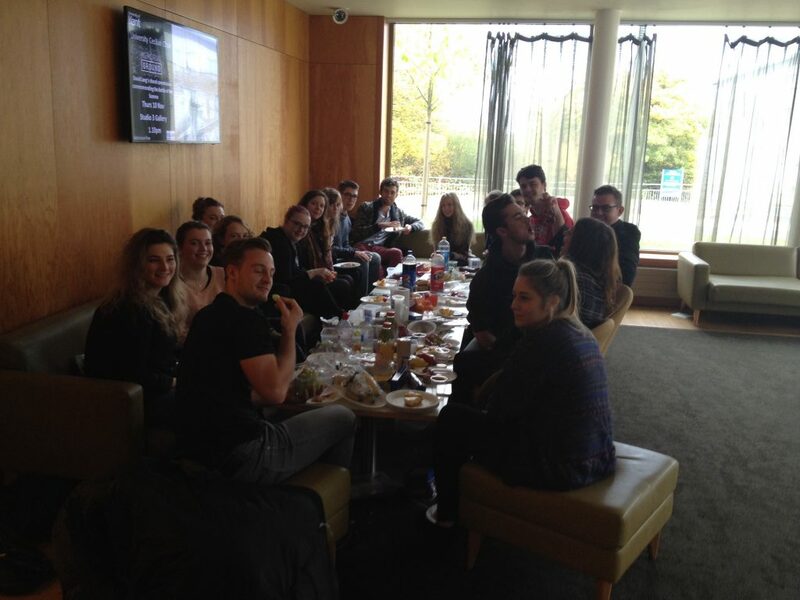 There’s a genuine sense of trust and confidence in one another that has developed over the term, and they have become not just a group of students getting together to sing once a week, but a committed group of friends, with whom it’s been an unmitigated pleasure and a privilege to work this term. As the candles filed out of the Cathedral after the service and into the night, the words of Steve in the tenors came to mind: ‘’I’m starting to feel really Christmassy now!’’ Just for a moment, at the very start when the Cathedral was hushed and the Choir began to sing, the orange glow of the dancing candles lit up not a group of singers, but a window into a deeper community, a miniature reflection of what life at the University is all about: different peoples coming together, joining in a communal enterprise, and becoming fast friends in the process. 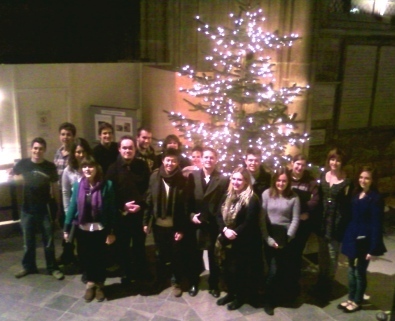 This entry was posted in Concerted effort and tagged Canterbury Cathedral, Carol Service, carols, Chamber Choir on December 13, 2011 by Daniel Harding.